Closely related to salmon, trout are mainly freshwater fish but there are different varieties such as sea trout which are salt-water dwellers, river trout which are freshwater fish and rainbow trout who hover somewhere between the two, spending a few years at sea before returning to fresh water to spawn. 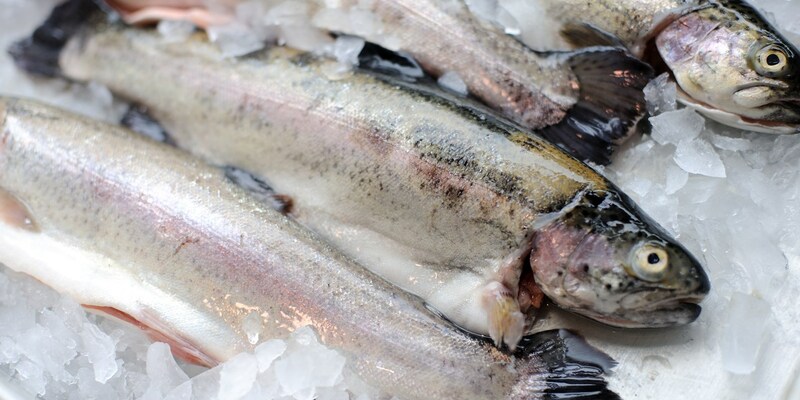 Rainbow trout has a slightly nutty, sweet flavour and tender flesh. The larger fish (1kg or more) are tastier. Sea trout are brown trout that migrate – identified by their vivid pink flesh and considered a prized fish by anglers and chefs alike. Sea trout feast on crustaceans and are deemed the most flavourful of all the species. Whilst brown trout is indigenous to the UK, the most commonly farmed trout on these shores is the rainbow trout which is native to the US. Like salmon, farmed trout has a reputation for tasting bland compared to its wild cousins. Trout is not considered endangered though certain stocks are under threat. The Good Fish Guide claims that ‘buying organic farmed trout is the best choice’. It also advises not eating sea trout during its breeding season, from November to March. As with all fish, trout should be purchased only when fresh. To check if a whole trout is fresh, look at the eyes which should be clear and bright and the gills, which should be bright red. The older the fish is, the darker the colour of the gills will become. The smell of fresh trout shouldn't be unpleasant. Fresh trout should have a natural slime and be firm to the touch. Cooking trout whole . . . There is little better than a whole trout doused in olive oil and wrapped in foil with some smashed garlic, lemon juice and herbs before baking – and it’s a great option for the barbecue or grill, too. When cooking a whole trout, it is best to slash the thickest part of the fish a couple of times on each side. This helps the heat to penetrate the flesh which allows for even cooking. Cooking trout fillets . . . When cooking a fillet of trout, make sure that it has been pin-boned. An average fillet is about 100–150g which is ideal for pan-frying, poaching, steaming, grilling and cooking en papillote. Steaming trout will bring out the full flavour of the fish and help retain the moisture. Steaming is a particularly East Asian way of cooking trout so try serving with Asian vegetables and spices. Trout is excellent for ceviche – its oily flesh and subtle taste works very well with acidic marinades. However, as with all raw preparations, you should make sure that the fish is very fresh, ideally caught that day. To check that trout is perfectly cooked, insert a sharp knife or skewer into the thickest part of the flesh – if it’s cooked through, the knife will come out hot to the touch and the flesh should turn opaque and have a slight resistance when prodded. The flavour of the fish will depend heavily on the breed of trout you are cooking. Sea trout is especially revered for its flavour – butter or browned butter is sometimes all that’s required. Otherwise, the acidity from lemons, lime or tomatoes cut through trout’s oiliness, as do hot horseradish sauce and briny capers. Dill and parsley are great herbs to serve with trout and wild rice, samphire and asparagus are also ideal accompaniments. Strong, salty meats are well suited to serve with trout – bacon and chorizo in particular – while salty cockles or clams are ideal seafood accompaniments. Trout's subtle nuttiness lends itself well to being paired with almonds – it is famously paired with flaked almonds in Trout amandine and with brown butter and almonds in Trout meunière amandine. Freshwater trout usually carries an earthier flavour, so is best paired with other similar flavours like potatoes or most kinds of pulses. For counterpoints, the traditional pescatarian partners of lemon, fennel or dill all work brilliantly but if you want to be slightly more interesting, consider using Japanese flavours like shiso, sesame or wasabi.